My running shoes are out of business until further notice - I love racing and miss it incredibly - but I still wanted to share a race recap. 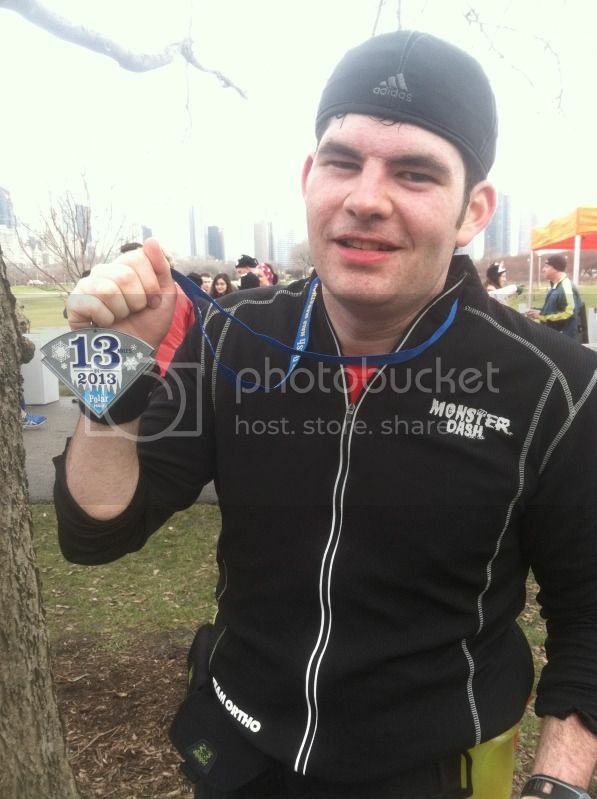 This comes from, of course, Matt, who ran a half marathon last Saturday. Funny story: he told me he wanted to run a January half, so I signed him up for one. Turns out, he meant a different one, and had already registered for that one also! So this is the first of his two half marathons this month. Enjoy! I ran the Rock n Roll half marathon with Mary in July of last year. I'd signed up in the winter, and didn't think about what Chicago mid-summer might be like - and with heat in the 80s on race-day, it was a struggle. Plus, I had attained a minor injury a few months before and surgery was scheduled for less than a week after race day, so I needed to be careful. Running the race with Mary was great, and I took the event as more of an experience than an actual race - I knew I would overheat if I pushed it. Even so, we walked more than a quarter of the course, which was extremely disappointing, and I was dissatisfied with my time, nearly three hours. I didn't feel like I earned eating anything decent after the race and I definitely didn't feel like I deserved a medal afterward. The bib felt like a reminder of failure. I knew I could do better and wanted to run another half marathon in more favorable conditions, so I signed up for one in January. I ended up being registered for another two weeks before and took that as another challenge. I had surgery mid-July, and stopped running for about two months. I then started back into running, and resolved to improve my form. I tried out running with Newton Gravity shoes, which were designed to force the runner to land on the forefoot and use the calves instead of quads and hamstrings, lessening the impact on the leg and knee, which was where I had major problems. Unwisely, I tried to run too far too quickly and hurt myself badly, pulling my calves. I could barely walk for a week. Even when I tried to ease into them like recommended, my time had dropped off immensely, so I gave up on them, got a pair of minimalist-style Brooks Pure Connect shoes, and went from there. My times returned to where I'd expected, and got down to business around November. I used a Hal Higdon half marathon plan as reference, though didn't follow it religiously - I ran two to three times a week, with one long-run at minimum. I ended up running a half-marathon a few weeks before the actual race and ran at least nine miles per week in the month that led up to the race, but had to stop a few times due to massive knee pain. I was very apprehensive. I had expected that the race would be in winter conditions, but Chicago's "winter" has been one of the most bizarre I've ever seen - on race day, the temperature was almost 50 degrees, and it was windy. I never would have believed I'd run a race in shorts in mid-January, but I did, and even ended up taking off my midlayer almost immediately. This actually turned out to my advantage - these were almost perfect conditions for running the best I could. I packed three gels, three bottles of Gatorade and one of water, put on my patellar straps, and was good to go. During the race, I decided to leave everything I had on the track - and to use a piece of advice I'd recently heard to my advantage - attack and defend my position at all times. I ended up being nearly late to the race, and had to start in the back of the pack, with slow runners, even slower than me. Though we were running on the narrow pathways of Grant Park, I ran on the sides of the paths and passed a good number of people. I felt good, and kept monitoring my pace - I was moving, doing a sub-9 mile, which for me was pretty fast considering I had to go 11 miles further. I kept attacking and passing, particularly on hills - when everyone else slowed down, I pushed through and sped up. I felt like I was doing very, very well by the 10K - 56:36, and I took out my phone to record the time. I felt like I was doing very well and could maintain my pace - knees didn't hurt. While messing with my phone and saw I had a voicemail from work - I listened to it, a request for me to come in early. I actually called work and talked with the front desk for about 30 seconds - something along the lines of, "I'm currently in the middle of my half-marathon, there's no way I'm coming in early, thanks" - and I think I managed to speed up from being so frustrated. My pace started to slow down after the 10K mark, but I kept moving as best I could ,as my knees started to hurt a bit. I stretched out my knees and improved my form, and the pain mostly receded. Strangely enough, the piece of gear that bothered me most were my new, very warm smartwool socks - I could feel them moving around in the shoes, and I felt like my feet were blistering up. It hurt to land on my feet and I tried to keep my cadence up. It's likely the pain in my feet offset the pain in my knees, which helped. Still, whenever someone would try to pass, I kicked back up the pace the best I could, kept on moving. I had expected to have to stop several times and anticipated a 10-minute mile pace at best - but with just a 5K remaining, I felt like I was doing extraordinarily well - and I could deal with anything for a 5K. I managed to pass the 10-mile mark at around 1:32:07, meaning I'd maintained a pace of around 9:12, pretty damn good for already having ten that long. My pace started dropping off drastically as my knees started hurting, and to let her know I was moving quick, I texted Mary, who was shocked at how well I was doing, and I asked her to go to the finish. Many of the runners around me were dropping off - but I tried to get them to restart as best I could. If I could do it, so could they. At the 12 mile mark, for the first time I could remember, lactic acid in my legs started building into some serious pain - I had reached the threshold of my endurance. That's a problem I usually had not faced in races, but it was a great sign - I'd pushed myself as hard as I could. I suddenly realized - I had about a mile left, and I had run for about 1:53 ... I was in range of a sub-2-hour half marathon. I couldn't believe it - I tried to speed up a tiny bit, but couldn't, and maintained. I kept up as strong as I could, crossed the finish line, and felt like my legs would break. This time, I actually felt like I'd achieved something - I felt good. I'd just barely missed a 2-hour half marathon and gave it maximum effort. Best of all, for the first time in a 10-miles-or-more race - the third I'd run - I didn't stop due to pain. I did have to stop for less than ten seconds twice in the beginning to adjust my patellar straps, but that didn't really count. I powered through the discomfort and overcame. I blew away my previous half-marathon PR by more than 51 minutes. I'm sure that some of it was attributed to conditions, but I take what I can. But perhaps most significantly, I'm confident that I can run these longer distances and not feel like death, under certain conditions. And I'm looking forward to my next half-marathon - two weeks from now. Awesome job Matt! I can't believe you called work while running a half! I can barely open my water bottle while running! Enjoyed your race report Matt! Great race Matt! Way to go attacking and defending your position. I am in awe that you were able to place phone calls and text while running. What a GREAT race report!! Thanks for sharing! Congrats & good luck on your next half.